Rest easy on a personalized pillow case! A dream of a project – Kids will love coloring their own pillow case creations! 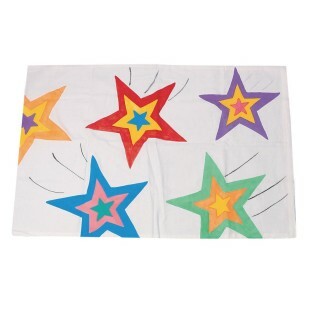 Includes 20" x 30" pillow cases, fabric markers and instructions. 100% cotton. Pack of 12. The pillowcases are a little thin but the final product does look good. Be sure to put thick paper inside the case within the area that you are working so the color doesn't bleed through. 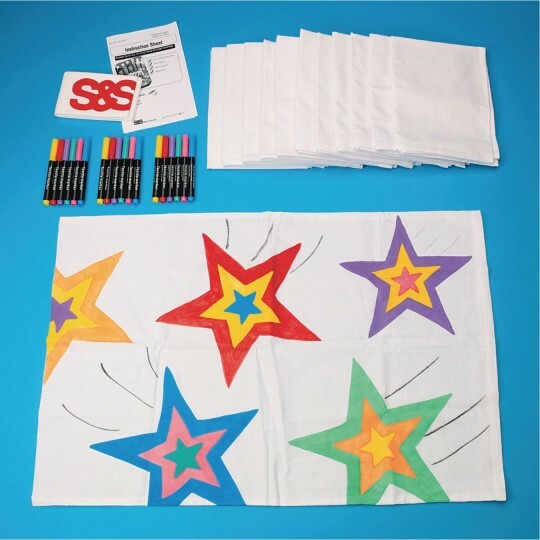 We ordered these pillow cases and fabric markers for a large group activity and the kids had a blast! The fabric markers were perfect and fun to work with. The only problem we encountered was that some of the pillow cases 8 out of 60 had spots of what looked like machine oil on them so they could not be used. We had ordered extra so it was ok. Keep that in mind when ordering. This product was used for a kids night dinner for residents of military housing. The children loved it great choice of colors for drawing on the pillowcases. But you need to place a piece of paper inside so that the paint doesn't transfer to the other side of the pillowcase. Very nice craft. Good quality cotton and the paints were easy to use because they are markers. Loved them.